When Arc’teryx hired Federico Sbrissa away from Dynafit in 2012, it was with the Procline in mind. Of course no one knew how the project would turn out, but the gamble was on a man largely responsible for the iconic DyNA and TLT5 boots. The result speaks for itself. The Procline Carbon may be the first true ski mountaineering boot, with carbon fiber ski performance and unrivalled climbing agility. The latter is enabled with a cuff that splits vertically while in walk mode, an innovation that offers 12° of lateral articulation. The boot is also truly sealed from the elements with a rugged, waterproof gaiter. Slip on the Procline and try not to slip off your favorite mountain. Cuff is made of carbon fiber with over-injected Grilamid to achieve lightweight stiffness. Rotating cuff allows 360® of articulation by way of a vertical split in the carbon cuff. 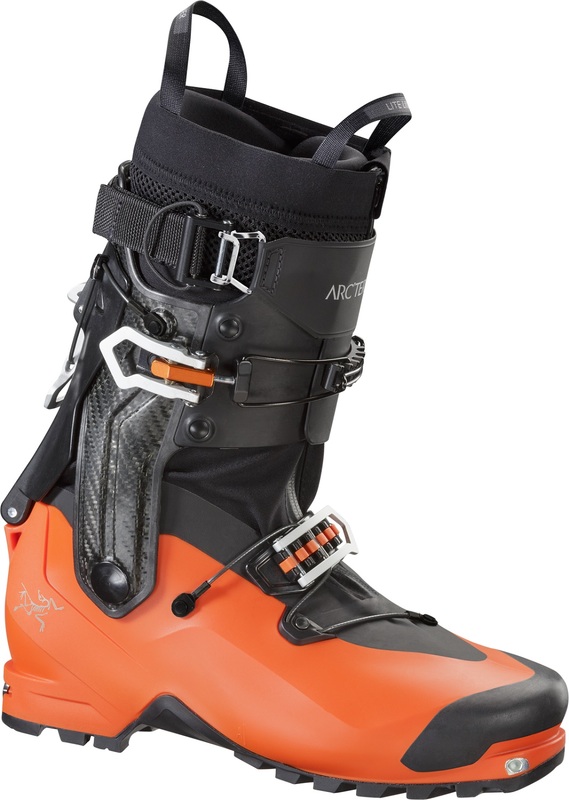 Hybrid Closure System enables climbing freedom and switches easily into ski mode. PVC coated nylon power strap offers exception pressure distribution with dynamic flex. Cam lock adjustment on the power strap is micro-adjustable with just a tug, no Velcro. Inserts are certified by Dynafit to ensure the critical boot-to-binding interface. High-density CORDURA® gaiter is puncture resistant and reinforced in abrasion zones. Gaiter is integrated into the shell for complete, waterproof and snowproof protection. Lightweight-yet-strong 6060 aluminum upper buckle secures the cuff around your calf. Optimal Fit lower buckle ratchets around a cable to hold your foot from multiple directions. Upper buckle lies flush on the boot to prevent opening and help fit under tight pants. Vibram® sole is optimized for climbing with a special tread pattern for rock moves. Rubber toe cap further improves grip in tight spots and adds to the life of the plastic. Choose from two liners: Support for rugged ski performance, Lite for optimized climbing. Thin rubber sole on the bottom of the Support liner is for walking around camp. When a company like Arcteryx decides to enter the game, you can be assured they want to take things to the next level. It’s what they are known for. This is the company that brought seam welding technology into the fray and made it a staple of their designs. The cut and stylings their softgoods define elegant simplicity and compliment the form of the human body while remaining consummately functional. The Procline Carbon boot is their initial attempt at putting out a “game changer” in the ski boot market. It has all the hallmarks of Arcteryx design. I’d argue that it’s perhaps the most eye pleasing ski boot on Skimo Co wall. A sleek, low profile toe. Bright orange color. Carbon cuff. Quality zip up gaiter. Visually, it stands out like a Ferrari. The walk ability of this boot is unparalleled in its class. It walks with little to no noticeable restriction. The much touted 30 degrees of lateral movement may or may not help this. In my experience while wearing this boot, it wasn’t noticeable. I tend to wear my upper cuff pretty loose while skinning and climbing so perhaps it’s not something I can feel but it may be working in the background. Dorsiflexion and plantarflexion are so smooth, free, and easy that I often felt disoriented at the loss of feeling from the cuff. This is a positive thing once you become accustomed to it and makes going back to other boots kind of a drag. The same features that make the boot walk so well, lend to it climbing very very well (for a ski boot). Range of movement with little restriction allows natural movement, keeping the wearer in balance and collected. I have not climbed any water ice in it, but have climbed enough rock and firm snow to believe it would do well. I could certainly see myself climbing up to WI4 with little to no change in technique from my dedicated climbing boots. The rubber sole has proven to be sticky and durable with little visible wear. The downside is that this is a 4.5 star shell cursed with a 1 star liner. It’s short lasted and slips fore/aft in the shell while skiing, it lifts out of the pocket in the heel while skinning, the tongue doesn’t stay put, and it’s not very moldable. A little surprising that Arc’Teryx missed so badly with this. My solution has been to use a Palau Tour Lite Performance liner in place of the stock liner. By doing so, I feel like I’m getting 100% of the performance from this shell design. Not too big a deal in the long run. Replacing liners for something of higher performance is common, even with high end boots. Procline Carbon can ski. It’s very very stiff laterally. Provided the user stays balanced and drives the ski from the ankle, it’s capable of driving a much bigger ski than its competitors. While it does have a very mild forward flex, when paired with the Palau liner it has never actually betrayed me in such a way as to lose control or crash. My complaint with the ski mode is the aggressive forward lean and no ability to adjust its position. Some won’t find any issue with its lean angle, but I prefer to be able to be slightly more upright. All said, this is a 3.5-4 star boot in my book. A better liner from the factory and some options for forward lean would bring this to a 4-4.5 star boot. If you are the foot shape that this boot fits, and are willing to play with different liners, the Procline Carbon is a capable, high performance, ski mountaineering machine. So far I have only one day on these boots and that's why I am giving only 4-4.5 stars as I cannot speak about durability yet. My first day was a full-on backcountry skiing in our Canadian Coast Mountains - about 7500f and about 7h (with a descent off a peak - true ski mountaineering conditions). I had them on my feet for about 1h the day before to figure out how they fit. No question these are snug boots, although, the liner gave in after about 2-3h of touring. The forefoot width feels about the same as TLT6 (maybe 1-2mm narrower), but they are lower in height in the front part and over the top of the foot - that suits my feet well. Note, that sizing is a bit "off" and you will likely need to size-up 0.5-1 size. However, this is only on paper because my TLT6 are 28 and 307mm while with Procline I had to go 28.5 but the shell is 305mm. Probably negligible weight increase compared to TLT6 but absolutely not noticeable once on your feet. I am impressed with the way these walk. Very smooth whether on skins or bootpacking. I put in a green Superfeet insole from my TLT6 and it spread the liner a bit wider. Overall, very resistance-free and nimble feeling walking/skinning in these. I knew they would walk well, after all it's Arcteryx, but I wondered about skiing. In 4 runs I skied everything from very wind blasted to breakable snow a glacier, to high alpine skiing off a peak, and tree skiing lower down - I couldn't tell a difference compare to TLT6 except the Procline liner feels to have better support higher up. Skiing steep (around 45 degrees) slopes felt very solid, hence, I wouldn't take a boot up such terrain on a first day if I didn't feel it was good enough. All the buckles, their positioning and tension do a great job adjusting pressure and lock you in. I skied them on Atomic Backland 78 176cm. Overall, I believe everyone would like how they ski. Of course, these are not for hucking big jumps but they will skiing anything (even drive a bigger ski than I had) and exactly what they are intended for. - Getting into the boot and out is little more demanding than TLT6. - The whole system of buckles was a bit daunting to me but after about 3h I was as efficient as with other boots. So it's just a matter of getting used to the boot. - I used the thinnest socks I have because the full gaiter looked warm (and I don't get cold on my feet) but I think it will be just fine for majority of people, and for women for sure. - I popped my old TLT6 liner in just to see how it feels since the shell length is almost identical, and they felt very much like TLT6 :) So if you find any reason for not liking the Arcteryx supplied liner then you can swap for your older one. These won't fit every foot (perhaps like the old TLT5 were a bit narrow for most) but when they do then you won't be disappointed.